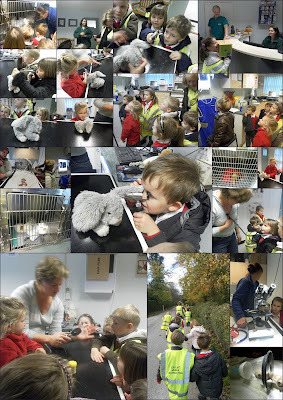 Earl Soham Community Primary School Blog: A Trip to the Vets! This afternoon, as part of their topic on animals, Red Class walked up to the Earl Soham Business Park to visit the vets! The children were shown around the reception area where appointments are made. Then, they looked around the preparation area and saw some x-rays and scans. They were also able to see some animals recovering following illness. The children looked at some of the instruments used in the vets when they try to find out what is wrong with the animals brought to them. Many thanks to Mr Cloete and his team for making us feel so welcome and giving us a tremendous experience - it really helped to bring our topic to life!